Mindscape in Words: Fanatic Fangirls. It was the first day of senior college. Aisha was optimistic about this year and what it would enfold. She had always been an outgoing person who befriended all her batch mates, be it school or classes. College was going to be no exception. She wasn't some it girl with a wardrobe of shoes. You could actually call her a tomboy. At least, she liked being called that. The first lecture of the first day began at 8 am. She took a seat in the middle row. Soon, others joined around her and the talks began. They discussed their past colleges, percentage in twelfth grade, time table for the day and so on. During break, some students went to canteen while some decided to roam in the college. As Aisha was leaving, she noticed a girl sitting all by herself in a corner, listening to songs. She was beautiful with a normal height and hair tied in a bun. Aisha didn't go to talk to her because of her undeniable hunger. But later on, she approached this girl, "Hi, I'm Aisha", she introduced. Removing the headphones, the girl replied, "Umm, hello. My name is Ruchi". Aisha began, "So you aren't hungry or anything? I saw you sitting here all the time." "Oh, not really. I was just listening to songs", replied Ruchi. With her ever lasting excitement, Aisha inquired, "That's cool. What are you listening to? I love The Beatles and Bollywood music." Ruchi replied in a calm manner, "Terry Ross". Aisha replied in a pretending manner, "Oh cool. I haven't heard much about her, though". The bell rang and it was time to get to their respective places. Ruchi was relieved that she was on her own again. Ruchi was the most introverted person you could meet. She was a good student and a crazy fan of American singer, Terry Ross. Just when she was comfortable being alone, Aisha came and sat next to her. They exchanged smiles. Ruchi didn't like her much, for the sole reason that she had no knowledge of Terry. To Ruchi's relief, the lecturer came in, which gave little scope for further conversation. However, Aisha kept talking, "Could you send me some of the best songs of this Terry person?" Ruchi rolled her eyes and thought, "Every song is a masterpiece. And what does she mean by 'this Terry person'!? Ughh". Anyway, she sent her a few songs. Soon, the first day was over, Aisha had already taken Ruchi's number and also promised to let her know about the songs. Aisha joined her other group of six friends whilst Ruchi left the college by 11.15 am. I just listened to Terry Ross!!! Guess what? I love her!! I mean, her songs are so real and filled with emotion. The youth can connect to these songs so easily!! I have all her albums on download right now and I don't even know how I didn't know about her! I seriously owe you one for introducing me to her. In the meantime, Ruchi was having lunch. She saw her soon-to-be-best-friend's messages twenty minutes later. She was thrilled and the happiest at that moment. She replied, " I know right? She just makes life better. Some of her songs seem like they are taken right out of my life!" Aisha replied in seconds, quoting a lyric, "This life just keeps on getting better.. better". Ruchi smiled and texted back, " Look who's a fangirl now!" "Oh yes! We are the fangirls!" Their chat continued for a long time discussing more about music and little about college. A bond of friendship was born as they drooled in the fandom of Terry Ross. The following couple of weeks went fast. There were assignments, presentations, studies and exams. Aisha had talked to everyone in her batch but every one was not a friend like Ruchi. On the other side, Ruchi only had one friend in Aisha. One day, they both were returning home from college by bus. They had their headphones tucked in their ears and were enjoying themselves. After one point, Aisha started to lip sync. She made hand gestures that went along with the actions in Terry's music video. Ruchi joined her. The rest of the people didn't matter to them as they were engrossed in the music. Soon, they had a twitter account dedicated to Terry Ross. For people who are unaware of this, there are millions of accounts on social networking sites like twitter and tumblr that are pure fangirl/fanboy accounts. Their twitter experience was one of joy and adventure. Whenever there was any award show, both of them spent their time tweeting for Terry to win. The most appealing fact was that they were not the only ones, which made them feel not insane. They even befriended two girls, Geet and Shruti who lived in the same city and were equally crazy about Miss Ross. Geet was a graduate whereas Shruti was a 26 year old working woman. They had a group on which they chatted constantly. Internet friends weren't so bad after all. Then, one day, Terry announced the news of her new album. The fangirls had no chill. Their excitement levels reached the roof and blasted above it. They couldn't wait for Terry's new album! Aisha began, " I cannot wait till 10th of March! That's three months away!" Ruchi said, "I already know that her album is going to be fantastic. I just want her to tour India this time!" "Hold on, what if she never tours here? She knows that she has crazy fans here, right? We cannot just wait till she comes here!" "We don't really have an option, you see! ", replied Ruchi in a sad tone. Aisha replied, "I guess you're right." Those three months flew by. There was a lot of studying to do for the finals, which went pretty great for both of them. Aisha and Ruchi were free by first week of March. Finally, 10th March came. Aisha came over at Ruchi's place for a sleepover. Geet and Shruti joined them as well. By then, the four of them became pretty close. They even hanged out a lot of times. The album titled 'Binary' was out. After listening to it once, they realized that this album was on a whole new level. Terry just kept on raising the bars for herself with such incredible lyrics, sweet vocals and mesmerizing music. The four were mind-blown. They jammed to the album in a loop for five times. It was exhilarating and astounding to be a part of something so beautiful. The next day, they watched their favorite Bollywood movie named 'Queen'. Aisha got a lot inspired by watching that film. She thought, "If Rani can survive in a city like Paris, then why can't I? She can't even speak proper English and doesn't have any confidence either. Apart from all that, she grew into such a mature person in a short trip! Then why can't I do the same?" The movie always made her feel this way, but this time it was serious. She was an independent, confident and wise girl. And so were her three pals. Then why couldn't they achieve their dreams together? Maybe they could. She devised a plan. 'Mission Terrry Ross, Australia'. Aisha convinced her parents after some of her usual techniques. Geet and Shruti were ready for it. There was going to be major convincing at Ruchi's home. Her girl gang gathered at her home. Aisha tried her charm. Geet showed the practicality of the situation and that there was no harm. Shruti's words made the difference. She was a grown up. So, Ruchi's parents finally agreed when they understood how sensible and caring Shruti was. It was quite unbelievable to them even. They were going to see Terry Ross! By the end of the next day, it was decided that Aisha, Ruchi, Geet and Shruti were going to Australia to watch Terry Ross live in concert!! Destiny was with them. Right from convincing their parents to accepting their own fearfulness to travel without them, they made up their minds to witness the luckiest and the most awaited day of their lives. On 2nd June, four young ladies started their journey. They couldn't talk much; partly because they didn't believe that they were going to see Terry Ross and partly because it was going to be the best day of their lives. 4th June was D-Day. Aisha rocked a denim jumpsuit with converse sneakers and a hat. She could almost pass for a country girl. Ruchi looked cool wearing shorts and a hand-painted tee which had the words 'Terry Ross forever'. Geet wore a sparkly black top and black jeans. She looked like a total party animal. Shruti looked elegant in a sundress and her perfect makeup. They all dressed up more excitedly than they ever did. They carried a huge poster with them. It had 'Binary' written in the center with the album art. There were lyrics on top and bottom of the poster. Some cut-out pictures of Terry Ross were stuck over it. 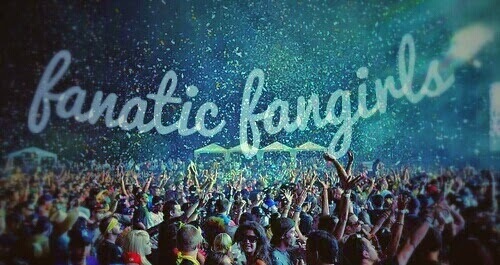 'fanatic fangirls' was written at one corner and it had a lot of glitter. It took them 8 hours to finish it and were pleased with it. They left for the concert 10 hours early because they knew how huge Terry's fanbase was. The huge stadium had sold out within minutes! Those 10 hours went by slowly. When it was almost time, tension started building up within them. The level of anxiety, enthusiasm and adrenaline was getting higher by the minute. Once the gates were opened, the sea of fans raced inside like their life depended upon it. That hustle reminded them of Mumbai local trains! They got their seats in front of the stage, in the sixth row or so. The moment was going to be anytime now. Terry Ross came up on stage. The audience screamed their throats out at her first sight. The voice of the stadium reverberated around and around. That was the moment. They looked at each other and they knew that this moment was much more than they had ever imagined. It was so much more. That feeling was beyond anything. They started singing out loud with Terry. They listened, sang, danced, enjoyed and cried. It was pure magic. Terry Ross concluded by saying, "I am here because of you all. You fans are the reason that I love to create music. I love you all and I know you will stick with me till the end." With those words, the show ended and the hearts of everyone melted. That day, the lives of Aisha, Ruchi, Geet and Shruti changed forever. They saw their idol live. They spent years listening to her music, following all her social events, defending her against the haters, praising her words and loving her for what she believed in. Terry Ross, to them wasn't just a musician. She was their idol. They felt happy because of her. They got their hearts together after a heart break because of her. They felt like themselves because of her. They were just some fangirls living a fanatic life! First of all, I can connect with your characters' love of music- certain songs and singers have gotten me through highs and low of my life. Secondly, I really like right from the beginning that you establish the main characters through indirect characterization. Nice short story! I enjoyed reading the friendship development of Aisha and Ruchi. Eager to read about what happens next! I love how creative you are! You always intrigue my mind!